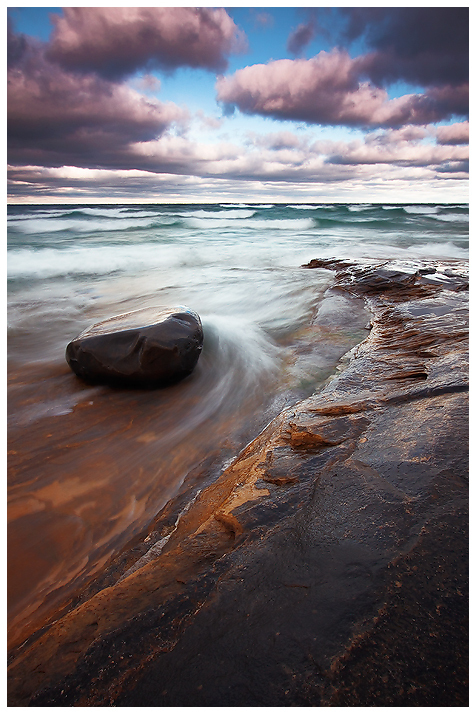 A lone rock sits off the coast of the Pictured Rocks National Lakeshore. Large waves came into the layered rock peninsula with great force, creating very interesting currents. A shutter speed of one second slowed the water enough to show its movements, yet froze the waves in the background enough to highlight the turbulent conditions. 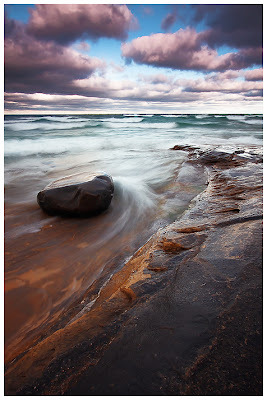 Technical details: Canon 7D, Canon 10-22mm lens (@ 13mm), 2-stop reverse graduated neutral density filter, 3-stop neutral density filter, ISO 200, F/8, 1 second.